Yesh Tikvah- The essence of this song can be captured in the following short story. My brother in law came home with the new CD and told his 3 year old son that he had something to play. He turned on this song and the 2 of them danced around in pure joy! This techno styled song, composed by Ari Goldwag and arranged by Ian Freitor, is a cheerful song telling us to be joyful and full of hope that everything will be ok (thanks to the liner notes I can actually figure out the Hebrew!). As those of you who read my reviews know, I am not a huge fan of techno music, but this song has me hopping and dancing (like only I can) and I love it! Haboicher- Benny is lucky to come from a very musically talented family, as his uncle is Avraham Fried, and his cousins are the Marcus Brothers of Eight Day fame. This disco hit is composed by Bentzi Marcus (from Eight Day) and arranged by arranger virtuoso Leib Yaakov Rigler. The inimitable background vocals are by the very talented and creative Yitzy Spinner. This song, besides being a real nice song, also has some real nice “knaytches” in it. I like how it starts like its being tuned in (I know it’s been done before but I like it), the bass guitar solo, how the song gets slow and the subsequent Rocky like guitar riffs. Benny range and voice really shine on the ending. B’Sheim Hashem- This is a folksy yet hartzige song that I absolutely love. The song is composed by an unknown in the JM scene (gasp….you mean it’s actually possible to put out an album without using all the songs from the most famous composers…..yes I am being sarcastic) Marc Levine, who also sings with Benny. The song is dedicated in memory of Marc’s mother. The song, arranged by Leib Yaakov Rigler, starts off very simple and easy and the arrangements build as the song progresses. The modulation that begins at 4:13 is just absolutely gorgeous and from there to the end of the song just highlights what I love about Benny’s voice and singing talent. Maaleh Ani- This classic rock song, composed by Elimelech Blumstein, is very tastefully arranged by the amazing rock guitarist, Aryeh Kunstler. I knew Aryeh had arranged a song on this album, and pegged this one as his arrangements before I had even looked at the cover. The background vocals & intro are by Ari Goldwag. The ending of this song is one that arrangers who currently have abrupt endings (yes, another of my pet peeves) should listen to and be inspired. This is a tasteful and simple ending that doesn’t take up much time and effort but are much easier on the ear. Shalom Aleichem- The song starts of a bit eerily but I get the concept with the 2 classic Shalom Aleichem niggunim being featured, and when I was listening with my son, he started singing along to it. This song composed by Ari Goldwag and arranged by Ian Freitor, is a mix of a disco and techno styled song. It is a pleasant song that sort of ties in the older style of Jewish music and the current fresh sound (HT to Kol Isha for first it pointing it out to me). I could have done without the chanting interlude. Reminds me of a joke I once heard: “Singers sing and Cantors can’t”. Mamleches Kohanim- This slow and heartfelt song, composed by Elimelech Blumstein and arranged by Ian Freitor, is especially poignant this time of year after we spent so much time reminding ourselves that Hashem is our Melech, our king. That makes us as Benny sings, Mamleches Kohanim V’goy Kadosh, a kingdom of priests and a holy nation (thanks again to the translation in the cover). The interlude at 2:51 beginning with a guitar solo and ending with a modulation is very nice! Ivdu- What a fun and happy sounding song! I fell in love with the intro when I heard the preview and hearing it in full and uncut, I love it even more. The song is composed by Yoni Eliav and Benny, and arranged by Yaron Gershovsky. I really like how Benny plays with the phrasing on the high part and sings it slightly different each time. I really enjoyed the synthesizer interlude at 2:51, and the ending, once again is a very tasteful way to end simply and not abruptly. Dor Acharon- I don’t know if the “oompah” style songs are coming back in style again or not, but this song composed by Elimelech Blumstein and arranged by Ian Freitor, is a throwback song and is a very calming and enjoyable song. Vahavioisim- This rock ballad is a pretty interesting and different (and I mean that in a good way) song. Composed by Yitzy Waldner and arranged by Ian Freitor, the song has a modern sound and feel to it. Adding in Yitzy Spinner’s background vocals (wow) and Gal Gershovsky’s bass drum (boom) to Benny’s ultra ridiculous voice just makes this song even better. Dawn of Moshiach- This disco song, composed and written by Elimelech Blumstein, arranged by Ian Freitor highlights how we are ready for the dawn of Mashiach (bimhayra v’yamaynu in our days). This song as well has the background vocals by Yitzy Spinner (he really out does himself from one song to the next). The reggae interlude just highlights another one of Benny’s many vocal talents. Berachamim- This haunting song really encapsulates the meaning of these words that we’ve been saying daily for the past few weeks. The song, composed by Ari Goldwag (who is also featured vocally on this song as well), arranged by Ian Freitor, and with background vocals by Yitzy Spinner, is beautiful and heartfelt. Sometimes I like to have the last song of an album be a pumping lebedike song, but this song is really a perfect ending to an amazing album. In conclusion, if you haven’t figured out yet, I absolutely love and recommend this album! There is really no other way to say it! It is available at http://www.mostlymusic.com/yesh-tikvah.html or anywhere good Jewish Music is sold! 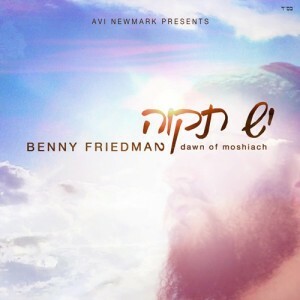 I agree with everything you write, this is a well abover average CD and Benny Friedman has an amazing voice. Thanks Meir! I am sure when Avraham Fried was Benny’s age (and I have his early records so I can tell you for a fact he’s a million times better now) he couldn’t do what he can do now. Pay attention (a little) in class and hopefully shabbos will be dry and warm! I’ve heard Benny sound as good if not better than Fried. I think Bennny purposely holds back for fear of just what your saying. What should the guy do? We should celebrate this! And truth is. Like OOT just said, Avremel at Benny’s age didnt sound a tenth of how amazing he sounds now. I’d say that Benny today at this stage and age sounds better than Avremel at that age and stage. And one other thing. MBD now is at end of his career. We have no new MBD for foreseeable future. Avremel has at min im yitze hashem another 10 (15?) years in him. Imagine what Benny will sound at that point! We’re lucky we have now and hot new star and at some point in future another Fried. Sounds like a win, win, win for everyone!! I agree this was an excellent album( cd is so outdated). I was a little disappointed that there was no Yossi Green song on the album. No legitimate Jewish music production does not have a Yossi Green song, and those backup vocals are so geshmak. Have you ever performed with Benny? If so how does he compare live to the others youve sung with?